A must see for anyone interested in visiting Nepal or has traveled there themselves. You'll feel like you're back in this enchanting land of mountain peaks that reach as high as the highest thunderheads. With rivers that churn their way furiously through narrow valleys flanked by rice paddies rising thousands of feet above the river bed. 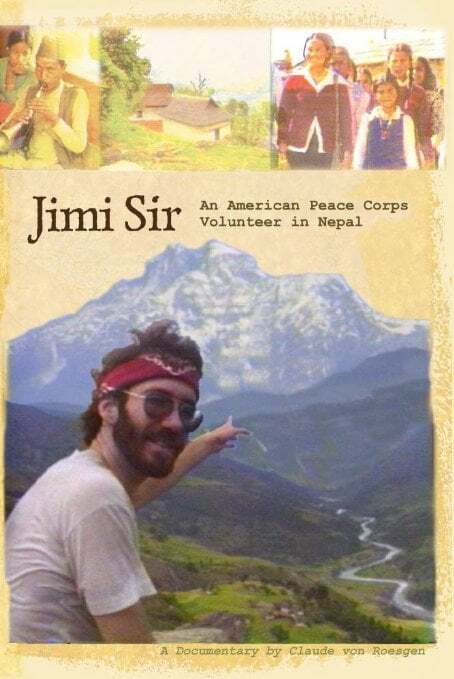 If you're a returned Peace Corps volunteer, interested in becoming a Peace Corps volunteer, or know anyone who did Peace Corps service you'll definitely want to watch JimiSir. Jimi and I got to be good friends senior year in college. We vowed not to do the corporate thing and to go on adventures instead. So after graduation in June of 1979 I took a solar design consultant position with an architect and Jimi worked as a software engineer and we saved our money. In June of 1980 we set out from Cambridge west towards the Appalachian Trail. In 80 days we walked 800 miles down to Waynesboro Virginia. We both ended up back in Somerville in the later fall of 1981. Jimi started talking about the Peace Corps. Before he joined in 1982 he extracted a promise from me that I would visit him. I agreed provided that he participated in making a video documentary about his experience. We wrote letters back and forth during 1982, 83 and 84. He picked the fall of 1984 as the best time for my visit. In re-reading the letters I received from Jimi he warns me that I should have a plan for what to shoot because otherwise he felt it would be easy to get lost in the sensory overload of Nepal. In truth I didn't have much of a plan other than to focus on Jimi as the main character of the program. Initially I had planned to stay in Nepal for eight weeks from the 15th of September thru the 17th of November. When I met Jimi in Kathmandu we (including a bunch of Jimi's Peace Corps friends) headed out to do a trek near Pokhara. We started at Dumre and I managed to keep up until we got to about 10,000 feet. I got sick and recuperated while the Jimi and his friends continued to Jomsom. I descended and did some videotaping of the village of Bagarchap where I got the bulk of images of the Tibetan way of life. I met Jimi back in Kathmandu. When we headed out to Melung from Kathmandu I knew that this was an important trip to document. It established the nature of Melung by contrast with Kathmandu. It reprised the first trip that Jimi had made to his post and all the trepidation and loneliness that he faced. Most of what you see in the program showing the trip to Melung was as it happened when I arrived there with Jimi for the first time. The scenes of Jimi and I walking side by side were staged later. I just felt that a side by side shot was missing otherwise and would most likely be useful in telling the story. I became known as Claude Sir and we were invited Krishna Mooni's I think because we had the video camera. Jimi probably would not have experienced the puja ritual of Tihaar in such an intimate way if it hadn't been for the presence of the camera. Jimi convinced me to stay an extra two weeks into December so that we could capture Jimi's departure from the village. I actually traveled back into Kathmandu from Melung and extended my trekking permit for another few weeks. Interestingly enough my trekking permit really didn't cover staying in Melung but nobody seemed to be checking up on these things. As I stayed in village I felt a pull to become more a part of it. To learn more of the language. However I felt the other pull of concentrating on telling the story by making sure I had all the audio and video pieces I needed. I knew I wasn't going to be able to pop back to Nepal to pick up a shot here and there as I was editing the program together. So I felt that in some sense I was more aloof as a visitor to Melung than if I had been there for the same amount of time with no documentary agenda. I might have taken more time to learn the language for instance. But never the less I became part of the village and established a relationship with several of the people there including Thapa, Kumar and Krishna Mooni and the school kids. The epitome of this dichotomy occurred during the farewell ceremony in the school yard. My initial plan was to act as a fly on the wall. But it quickly became clear that the village wanted to say goodbye to me as well. So as I was taking the wide shot I was urged to come into the circle and they put wreaths around my neck as well as Jimi's. I looked very similar to Jimi with a lot of red powder in my hair. We ended up wearing this farewell token in our hair for several days as there was no real opportunity to wash it off. The story structure from my point of view is really a journey to the village, a day in the village and the farewell and journey back to the US. It's Jimi's point of view as he's the main character. You learn what he experienced personally as he confronted his loneliness amidst this extraordinary culture. But Nepal figures as an equally important character that you see really through my eyes. I tried to show the details that fascinated me. Jimi provided all of the verbal explanations that sometimes you get through the narrator's voice. But I tried to use Jimi's words directly as much as I could.